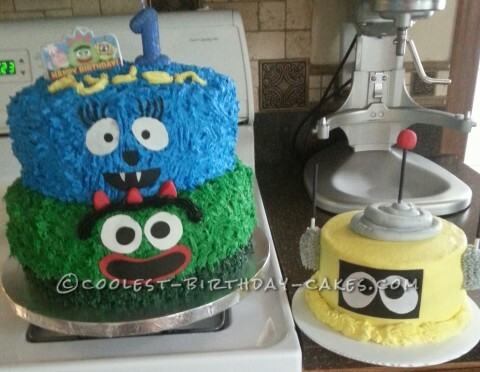 This Yo Gabba Gabba cake was created for the 1st birthday of my friend’s grandchild. He loves Yo Gabba Gabba and so that set the theme. The bottom of the tier is 3 layers of chocolate cake with buttercream icing. I never did get the color of green that I wanted – even ended up with a batch of army green during my trial and error. In fact, I probably couldn’t dupicate the colors I finally arrived at. I felt a little like a mad scientist while mixing greens, blue, black and even some brown! Once I was satisfied that I got as close as I could, I put a thin base layer of the darker green over the entire cake. I then used the grass tip to create the fur. The eyes and mouth were made from sugar sheets. The red horns were made from fondant. The eyebrows were black buttercream icing. I felt the cake would need some support, so I placed 3 four inch supports cut from a small diameter PVC pipe (PVC was washed well and set a couple of days to ensure the inside was dry). The supports were pushed into the center of the bottom tier. The top tier was made of 3 layers of vanilla cake, iced with buttercream. I cut a plastic coated cake board to fit this tier. The cake was iced using a large star tip over the entire cake. Before the icing could crust I used a fork and a lite cross motion to get a different fur texture. I then placed the cake (with the cake board) on the bottom tier. The faces were made from sugar sheets and the eye lashes were black buttercream. The smash cake is 3 layers of vanilla iced with buttercream. I originally had not planned to decorate the smash cake much, but the tier cake was so cute I couldn’t just let it be plain. The face was made from sugar sheets. I cut a large marshmallow in half length-wise and placed it on sucker sticks that I colored with black. I iced the cut sides with icing and stuck them to each side of the cake. I then used a small star tip and iced both marshmallows with gray icing. I added another sucker stick with a red fondant ball on top in the center. The cakes were lots of fun to make and the party goers said they tasted as good as they looked!